What characteristics should the ideal bushwalking camera have? Will a smartphone do instead? Is a full blown DSLR needed? What about for those poster size prints? I am continually looking for the ideal bushwalking camera and each year I seem to get closer with each new product release. But each year I keep adding new "must have" features to my list, so I never actually get there. I remember having a Minolta Weathermatic 35 DL waterproof film camera in the late eighties with which I was very satisfied. 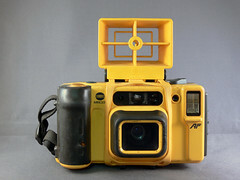 It had limited zoom and macro, auto-focus, replaceable batteries, and could be used underwater with its special sports viewfinder. It was way ahead of its time! I thought it did a great job at the time. But things have changed; cameras are smaller, have better zoom and the automatic settings make them truly point-and-shoot cameras! The ideal camera needs to be weatherproof, lightweight, have both zoom, wide angle and macro lens, with video capabilities, have a battery that lasts for the duration of your walk or is easily replaceable, have a screen that is visible even in bright sunshine, have a GPS and have ...... the list goes on. With each new model release the features become more impressive. Panoramic stitch, HDR, face recognition and focus, automatic backlight, 15 megapixel....Will I ever be satisfied? Can a smart phone meet all of these requirements? The iPhone 4 goes close, as do high end Nokias and probably many others. There are many situations in which a smartphone would be more than adequate and would meet most of my core requirements. The main problem is that to fit the features into such a small space, compromises need to be made. See some of my other iPhone posts for more details. Is a full blown DSLR suitable? Not for me; too heavy, bulky and only in poor light are the photos better. The equivalent of my Panasonic FZ35 18x zoom would weigh a ton in a DSLR. Possibly OK on a day walk, but I don't have the room or want the additional weight for an extended walk. With even point-and-shoots having as many as 15 megapixels, poster size prints are feasible without needing a DSLR. When I eventually master taking good creative shots with my point-and-shoot I might want to print poster size prints or take shots in difficult light conditions, but until then I'll concentrate on getting interesting, creative shots, for which I don't need a bulky, heavy DSLR. Want some recommendations on particular models ?